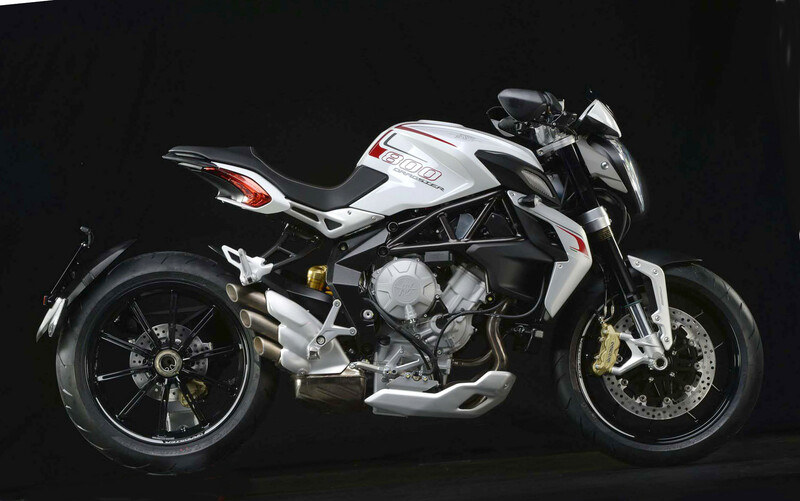 After a fair amount of teasing, MV Agusta today unveiled the Brutale 800 Dragster model, which appears to feature the same 798 cc three-cylinder engine found in both the standard Brutale 800 and the Rivale, with a claimed 125 peak horsepower. 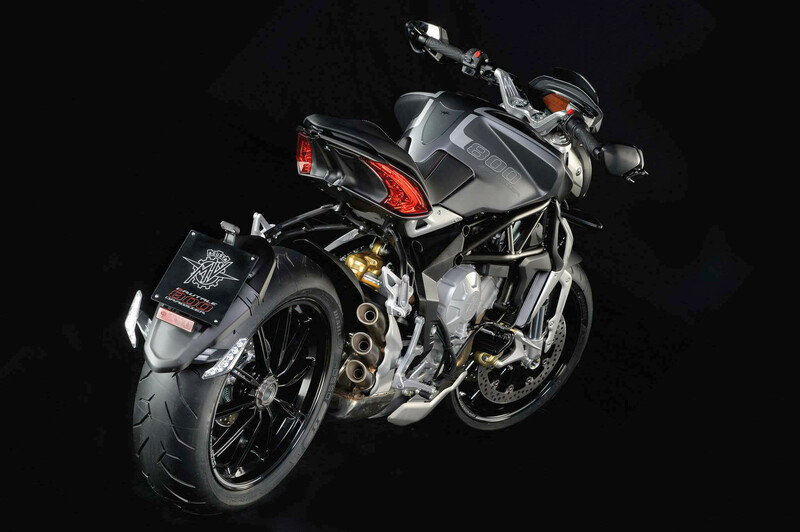 The Brutale 800 Dragster also features a sophisticated electronics package found on other MV Agusta models that includes four selectable ignition maps (1 customizable by the rider) and 8-level traction control. ABS is standard. U.S. pricing and availability date are unknown at this time. 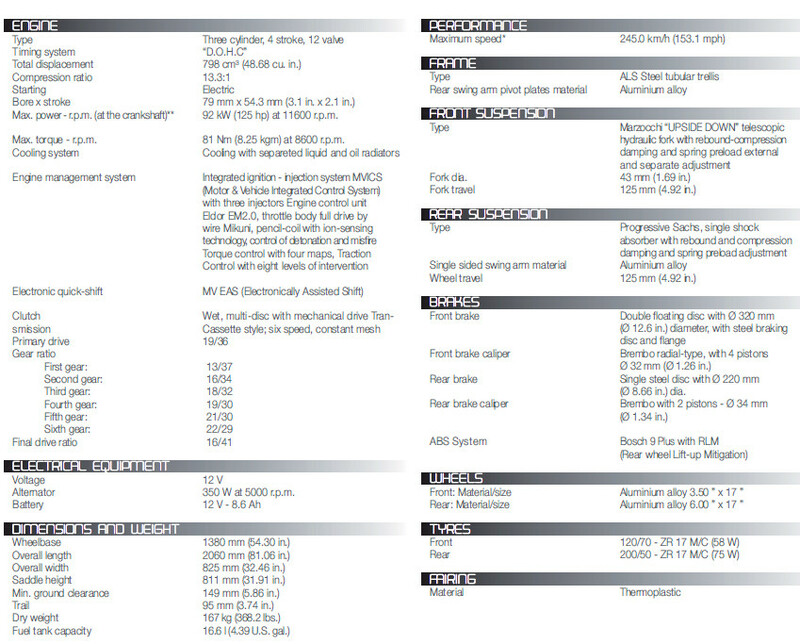 Here is the spec sheet for the new Brutale 800 Dragster. The overall look doesn’t really break new ground, but certain elements such as the integrated lighting/seat is nice new touch, one that I personally have not seen. I can’t imagine anyone sitting in the passenger position though. Might as well lop off the 2nd pegs and call it a monoposto and be done with it. The paint is typical MVA, that is to say…sweet!! The complex, highly faceted bodywork gives it a certain visual texture that is at the same time eye catching, yet subdued. The triple pipes are always cool to me and the fact that they are short and don’t obscure the SSSA is a MAJOR PLUS!!!! Kind of funky lookin…or maybe just funny lookin…don’t quite know. I bet it would be a hella lot of fun to mess around on though, regardless. Oops! (Got to reading in too many places at once) This belong with the burial story. At first I thought how morbid it seemed but a lot of that came from seeing him propped up like that. Then after thinking about it I realized humans have been buried with their treasures since forever. Why not? It certainly would be a first for me to be in attendance to something like this. The rear lights really take on more of an afterburner effect when the brakes are tapped into that corner. I would like one in the garage but not as my only bike. Previous tests on MV’s 800 bikes reveal piss-poor fuel mapping. I hope they’ve cured it.. this is a great looking nekkid bike. There’s a bit of the Confederate motorcycle in this bike. Can’t quite place it, but I like it. I get that vibe too!! Shorty seat thing I think…..hmmmm. Nice. I’m not usually drawn to this kind of thing, but I really like this one. When a company constantly introduces variations of the same product, to create the illusion of a diverse product offering, it just convinces me that the company doesn’t have the money and/or the talent and engineering to create truly different models and platforms. 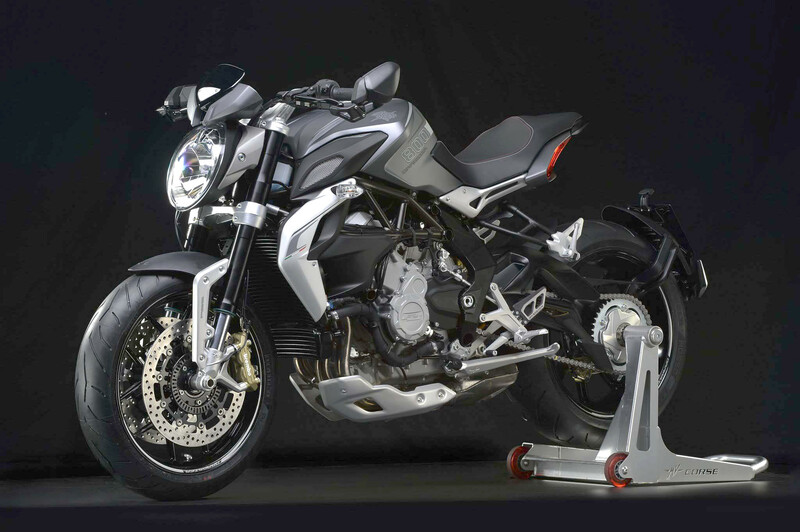 The original Brutale 675 has now spawned the Brutale 800, the Rivale and now the Dragster. All with the same engine case, frame and exhaust. You do realize to create new engine families is very expensive I’m sure? Even the Japanese who may have some of the deepest pockets haven’t used unique engines in every line they offer. Look at Harley. I miss the variety of engines compared to years ago but it just isn’t feasible to operate that way today. A sign of the times. “Look at Harley” right? same motor for 60+ years and you don’t hear anyone crying about that. They’re not crying because they gave up. Harley is just the SOS with slightly different styling. Slow and mostly cruisers. Nice bike, but not for me. How is a 6’4 250 lb man going to ride this tiny scooter? I guess I have outgrown sport bikes in the past 8 years. Guess I will have to stick to my BMW K12R sport! I doubt it as he has mentioned that he has outgrown it in the last 8 years and most teenagers cannot afford a K12R sport. Any liter bike should work with a bit of adjustment. He can always go to ZX14 or Busa. It’s always good to see new models come out, but like others have said, maybe a dealership network should come first. If I wanted to go down to the local dealer to check it out, I’d have to buy a plane ticket first. It seems like MV is going for Triumph-like product line diversity, without the dealer network to support it properly. Poseur written all over it. Yes, well apparently every motorcycle that isn’t a ratty old pre-nineties bike has poser written all over it. Call me a poser any day. Only poseurs call people poseurs. Real riders don’t involve themselves in the preferences and choices of others or care for other’s opinions of them. We just ride and are happy to see others choose to ride, whatever it is they ride. +1 Dave… oh wise wielder of words. Isn’t there sometimes a little ‘poseur’ in all of us? I’m a poseur, I like nice hot rods even though I’ll never be Nicky Hayden. After riding a 910 Brutale I’m not good enough to use it at all. Sure was fun while it lasted. Lemme guess.. you ride a Shovelhead Harley..
Just when the rear fender elimination kit manufacturers were getting comfortable with their business model….NOW THIS! The rear 25% of the bike seems to be missing. Why is MV releasing this model so similar to the existing Brutale? This could have been an accessory kit for the Brutale. I don’t understand it and I own an F3. no worries, this is the niche business of motorcycling. the Mob have “hit men” and reluctant committees have Market Forces. with the passage of time, this problem solves itself. A video of a hot triple and its exhaust note? No. Who wants to hear an MV’s exhaust note when they can hear bad heavy metal instead?!! I agree. So many vids of bikes will have just “the engine moaning out it’s one (or triple in this case) note song” why would bike enthusiasts ever want to hear that? Next video I make will have “Don’t fear the Reaper” or “Prison Song” by SOAD. I think I’ll buy a Vmax and put a rocking set of pipes on it, then shoota vid with “Midnight at the Oasis” pasted over the audio. I didn’t like it when Triumph did the seat “bob” to the Speed Triple, and I don’t like this MV “bob” either. Manufacturers please leave this kind of thing to the tattooed ones. Well, from the pics that space after the seat towards the rear just seems odd. I know, they were going for different, and maybe it looks better in the flesh, but with no dealers anywhere nearby, it will be awhile until I might see one. I would rather see a little more traditional rear end as far as seat and fender, but those rear lights may be ok. MV is really coming with some interesting bikes, but I will likely not have one if the dealers don’t get a lot closer. Get some dealers MV! Japan, Inc., sorely needs to send all their design stylists to Italy for a year or ten. Even the goofiest-looking MV Agusta still may as well be Adriana Lima compared to the constant parade of Mom Jeans wearin’ hausfraus constantly trotted out by the Big Four. If japan designers came back and designed all their bikes to look like this, there would be nothing left for me to buy. While some may enjoy a burger with jalapenos and pepper jack cheese on a specialty bun for $12, some of us still enjoy a good ol burger with american cheese, catsup and pickle on a regular bun for $6. I happen to like jean wearing hausfraus!!! Hate commercials where you can’t hear the sound of the bike. Nice bike though! MV is on the move and building some great and interesting bikes. They only had 4 models in 2010 and now …….. If they build up their dealer network then I will own a MV Agusta in the near futre, not sure what model, maybe this one. I really like the look of this but where would I hang my Pellican 1550s? Why is the rear tire only 8″ wide? I do wonder what effect that has on handling and how they addressed it. Not really my kind of bike but it sure does look pretty cool. Someone please show this to the Suzuki Design Team. I think the Suzukis are ugly enough, they don’t need any help. I must have one. Must. Although, wow. I bet it’s an expensive crash with all that bodywork. And oh yeah, get rid of that stupid plate holder already! The Federal Govt is responsible for the stupid plate holder. The license plate on all motorcycles must extend further than the rear tire which is why we get so many goofy extended plate holders. If that were true Harley wouldn’t be able to mount the plate on several models near the axel. Correct, it’s not the plate but the rear fender that must extend back past the tire. Is this a delivery requirement but not a use requirement? There are 1,000’s of riders who mod their bikes to remove them.